Disney’s Advance Dining Reservations. It sounds simple doesn’t it? And in most cases it is–as long as you book well in advance; you’re not trying for hard-to-get reservations; your group isn’t overly large; and you aren’t booking a dinner show or meal that requires a credit card guarantee or pre-payment. We’ll look at each of these cases, and give a few tips for making your Advance Dining Reservations go smoothly. 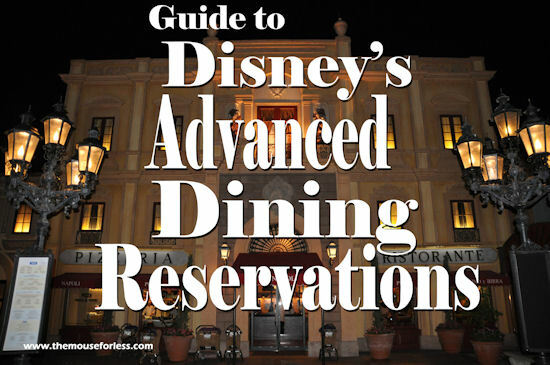 Disney’s Advance Dining Reservations are not reservations in the “true” sense of the word with definite seating times. They do guarantee, however, that you “will be seated” at the first available table after checking in at the podium for your reservation time. Actually, Disney recommends arriving 15 minutes prior to your ADR time. Waits generally range from a few minutes to a half hour. Think of Disney’s Advance Dining Reservations as Disney’s way of controlling the seating flow in their restaurants. Those that have Advance Dining Reservations will be seated and those that don’t, in many cases won’t. Disney highly recommends that you making Advance Dining Reservations for all of your table service, character meals, and buffet restaurants especially if you have purchased the Disney Dining Plan. Dining ADRs can be made from 7:00 a.m. to 10:00 p.m seven days a week (7:00 a.m. to 8:00 p.m on holidays) by calling 407-WDW-DINE (407-939-3463) or (407) 939-1947. Reservations can be made online anytime using the MyDisneyExperience (MDE) website or app. Online dining reservations open up at 6:00 a.m. EST 180 days in advance. Guests staying on or off Disney property can make Advance Dining Reservations. Those staying at a Disney owned-resort can book their reservations 180 days in advance, plus up to 10 days of their vacation stay, giving them an advantage over other potential diners to book all of their dining reservations at once. Guests staying at non-Disney owned hotels or resorts may book dining reservations 180 days in advance of their preferred dining dates, which means they will need to reserve dining for each day of their vacations, one day at a time if beginning 180 days out. When calculating Advance Dining Reservations dates, WDW guests should use their check-in dates (up to 190 days out) rather than their preferred dining date (check out our ADR calculator for help with this). If making reservations online, guests should make sure to connect their resort confirmation on MDE ahead of time, and if making reservations over the phone be prepared to give their hotel reservation numbers in order to book their Advance Dining Reservations all at once. Note: The Swan and Dolphin, Shades of Green and Disney Springs Hotels are not Disney-owned and would not qualify for the “180 day plus 10” perk. Many people find it impossible to plan their daily meals without first consulting the WDW park calendars to determine which parks will have Extra Morning or Evening Magic Hours. It’s useful to have an idea which park you will want to attend on certain days before making ADRs. Information on park hours is available roughly 6 months in advance, but is often subject to change. While the park calendar can be useful in planning, remember nothing there is written in stone. Plan ahead and know your Advance Dining Reservations booking windows. You can review Walt Disney World menus and dining suggestions on our web site and calculate first possible booking dates using our handy ADR calculator. Make a list of all of the reservations that you would like to book and have a few alternatives handy. You may want to review our list of restaurants that require a credit card to guarantee a restaurant reservation as opposed to those requiring payment in full at the time of reservation. You’ll also want to have your credit card info handy when calling Disney Dining or reserving online. If you have purchased one of Disney’s Dining Plans that covers the meal, your credit card won’t be charged for payment-in-full reservations, but you will still need to provide it as cancellation polices and charges will still apply. If you’ll be using Disney’s online reservation system, be sure that you first have an account set up with Disney’s website. You must register and sign in to your account to arrange dining experiences on line. Reservations can also be made by signing into Disney’s My Disney Experience mobile app with your account info. If your Walt Disney World reservation is not showing in your account, you may use the “Link an existing reservation” feature on the My Disney Experience main page to manually add your reservation information. You will need your Walt Disney World confirmation number, the last name on the reservation, your arrival date and the name of your Disney Resort hotel. Don’t worry, if you are not booked with a Walt Disney World reservation number, you can still make restaurant reservations and view a list of your reservations online. If you can view your reservation in the “my plans” section of the MyDisneyExperience app you are now set up and ready to go! If you use a Disney-specialized travel agency like The Magic For Less Travel, your agent will be able to access the online system and make all of your dining reservations for you, if you wish. Be aware, however, that reservations made online can only be cancelled by the LEAD guest on a dining reservation. Those booked through a travel agency may also use the online system to make and manage their own dining reservations. For the online Dining System, the new day starts at 6:00 a.m. (and sometimes a bit earlier), a one hour jump on those using the phone system. Diners using the online system should be able to get some of the more coveted reservations before Disney Dining phone lines open. Important Notice: Disney’s online dining reservation occasionally has glitches. For guests staying at Walt Disney World Resorts, the 180+10 days may not work. If you are staying at a Disney resort and want to book a restaurant on the first day it becomes available to you and this online feature does not work, you will need to call Disney’s dining line at 407-WDW-DINE. Occasionally, there is a glitch that sometimes charges guests for dining reservations when the reservation should be merely a credit card guarantee. This will clearly show with a dollar amount instead of credit card guarantee. If you are on the Dining Plan, reservations should show as a credit card guarantee in most circumstances for reservations that require prepayment. This has been happening mainly with Cinderella’s Royal Table bookings on the Dining Plan. IF this happens to you we advise you to remove the reservation from your cart as getting the refund processed can be very time consuming and may require you to give up that reservation. Once you have removed the item from your cart, you can checkout with any other reservations in your cart. Then call the Disney dining line at 407-WDW-DINE to get that particular reservation. Make sure to keep your eye on any Advance Dining Reservations that should be a credit card guarantee, especially if you are on the dining plan. Make sure you are signed into your Disney.com account, and then select your table service restaurant. Alternatively, you can use the “Make Dining Reservations” link on the My Disney Experience main page. If you have made any previous Dining reservations make sure they are are linked or use the “Link an existing reservation” feature to add them manually. You will need your dining reservation confirmation number and the phone number used on the reservation to do so. If you are still unable to see your missing dining reservations, call (407) 939-3463 for assistance. Click on or type in the name of a restaurant you would like to book in the search box. To check availability, you will also need to select a date, time, and party size. Reservations for up to 14 can be made online or an alert message will appear if a guest has chosen a location that cannot accommodate the party size. The Disney’s Advance Dining Reservations system allows you to choose a specific date and a specific time for your reservation or you may select from a “meal period” such as breakfast, lunch, snack or dinner. You can also search by location and cuisine type. You can search by date and times (leave location & cuisine as no preference and restaurant name blank), and the system will show restaurants and times that are available. If your selected time is not available, the system will suggest alternate times within a 3- to 4-hour timespan or request that you select another restaurant if nothing is available for that day. Once you have located your desired restaurant reservation, you can choose the people you are dining with from your “Managed” or “Connected” friends list. You may also add the names of those you are dining with to your reservation manually. Some reservations, such as Fairytale Dining at Cinderella’s Royal Table, will require that you use a credit card to pay in full to book. For more information, see our ADRs That Require a Credit Card section. If you have purchased the Disney Dining Plan as part of your reservation, the system will already have that information. Be sure to choose Level 2 or 3 seating for the Hoop Dee Doo Revue or the Spirit of Aloha dinner show if you are on the Dining Plan. Level 1 seating is also available for the late show at Hoop De Doo for those on the Dining Plan. Whether your reservation requires prepayment or a credit card guarantee you will be asked to enter this information in on the next screen. IF you have booked a dining package (Standard or Deluxe) you can choose between Disney Dining Plan Guarantee (for credit card guarantee) OR Credit Card Advance Payment. Make sure to read and understand any cancellation policies connected with your reservation. If you are choosing to pay out of pocket for your reservation, it will be charged at this time to your credit card. Once you have made your dining reservation, you will see the details for reservation on the following screen. Only the LEAD guest on a dining reservation will have access to cancel it, so make sure and pay attention which name you put it under. Choose primary contact, put in your email address and your cell phone number. You can also indicate any special dietary needs you may have or whether someone in your party has accessibility needs such as a wheelchair. You must read the polices for the reservation. Reservation polices include important information such as restaurant dress codes, cancellation policies, and other information. Agree to the reservation policies before confirming with the “Confirm Reservation” button. A copy of your reservation will be emailed to you. You will also be able to see all of your reservations on the My Disney Experience main page under the “My Reservations” link. If your reservations do not show, you may have used an email address or phone number that differs from the one associated with your log-in account. These reservations may not display when you visit the “My Reservations” page. However, you can manually retrieve them using the “Link an existing reservation” feature and entering your confirmation number and phone number for each dining reservation. Both online dining reservations and those made by phone can be retrieved online as long as 1) you have an Advance Dining Reservations confirmation number, 2) a phone number is associated with the reservation and 3) it is available to book online (i.e. a Perfectly Princess Tea Party booked by phone could not be retrieved online). Reservations are stored in your Disney.com profile. Once made, a reservation can easily be canceled by accessing it under “My Reservations.” Unless otherwise noted, dining reservations may be canceled without penalty. You may have to call Disney Dining to make modifications or cancel reservations for which full payment was made. Charges made to your credit card are usually refunded within 30 days. To view or cancel reservations, log in and then click “Dining Reservations” under the “My Disney Vacation” which displays at the top of the page. The online dining reservation system will not allow guests to book more than one reservation for the same timeframe (within 2 hours of another reservation). If a guest attempts to book a reservation that conflicts with one they already have, the guest will receive a pop-up message alerting them to this rule. In order to confirm the new reservation, the guest must cancel the previous booking. If for some reason you need to make multiple bookings at the same time (i.e., different members of the party are dining at separate locations), you must call Disney Dining directly and explain your situation to make the reservation or book the reservation online under another name and email address that is not associated with the resort reservation number (not a good idea for those on the dining plan). For a few special dining experiences, such as Perfectly Princess Tea Party and Wanyama Safari Resort Tour, you will still need to call Disney’s Dining phone line to reserve. An email reminder will be sent 24 hours prior to a dining reservation that includes the confirmation number, location, date/time and party size. The email will also include a link to modify or cancel the reservation. If you’re at the parks and have downloaded the ‘My Disney Experience’ or ‘Mobile Magic’ app, you can view and book available dining options on the go. Learn more about ‘My Disney Experience. Disney FastPass+ Quick Service, which will allow guests to select a quick service restaurants and order food up to 60 days prior to arrival, may be available at the parks in the coming days. Disney’s FastPass+ Quick Service should also allow guests standing in line for a ride to get a same-day time-window for an available quick service restaurants and order food prior to arrival, using only their smart phones. For more info on visit our MyMagic+ Information page. Dining reservations can be made for available seating up to 20 minutes in advance directly by Guests using the My Disney Experience website or via the My Disney Experience mobile app on Apple devices. Future enhancements are also planned to include the same booking feature on the My Disney Experience mobile app for Android devices. Make sure to cancel any Disney’s Advance Dining Reservations that won’t be used to avoid being charged a penalty. In order to make canceling of your unnecessary reservations easier at the last minute, Disney has set up a special number at 407-WDW-CNCL. You can also cancel your reservations online, or at any guest relations location, restaurant podium, or resort front desk. Lost your list of dining reservations or left it back in your resort room? No problem! Head to the nearest Guest Relations location or visit your Resort’s Front Desk where they will be able to print out your entire dining itinerary or access them online via ‘My Disney Experience’ web site or app. At the parks, RFID enable devices, either a MagicBand bracelet or Card will allow guests to tap the device against the sensor at the register to pay the bill either with cash or with any Dining Plan entitlements that may have been purchased. Visit our Guide to Disney’s MyMagic+ page to learn about this new technology. Things have changed at Walt Disney World! Once, vacationers could visit without planning meals ahead of time and have a fairly good chance of walking up and being seated at most table service restaurants. With the introduction of the Disney Dining Plan and frequent Free Dining Promotions that has all changed. To have the best chance of getting the restaurant of your choice, one should always make reservations as soon as the 180 reservation window first becomes available. This is particularly important during peak vacation times, holidays, during Free Dining season, and lately, just about anytime. For more information on crowds at Disney and dates and events that impact them, see our Choosing Vacation Dates page. The more flexible one is with dining plans the better chance of getting a reservation last minute. Consider having lunch instead of dinner at a particular restaurant or picking a different dining date or restaurant if nothing is available when reserving. If the reservation is at a non-Disney owned restaurant, such as any of the Disney Springs or Swan and Dolphin hotel restaurants, try calling the restaurant directly to make reservations. Most of these do not have all of their available space in Disney’s Dining Reservation system. You can usually Google for the phone number or make reservations through their online web sites. By phone, choose off times such as a quarter past the hour rather than on the hour or half hour. Online you may only select on the hour or half hour, but the system will show you available in between times. You might also try picking the earliest or latest dining times for a particular meal. Popular dining times are 12:00 pm – 2:00 pm for lunch and 6:00 pm – 8:00 pm for dinner. If you are staying at a Walt Disney World resort, you might also try choosing days closer toward the end of your vacation to help overcome the overlap caused by guests vacationing at slightly earlier travel dates and using the “180 days plus 10” rule. Split larger groups into several tables or even separate dining reservations booked close to the same dining times. Be sure to let them know at the restaurant podium that you are dining together. Disney tries very hard to accommodate guests. Disney’s Dining system has a rather quirky anomaly. While we don’t advise trying this often, as wide spread practice can cause difficulty, if there is a restaurant you are just dying to try and nothing else works, changing the number in your party can sometimes yield times or reservations that aren’t otherwise available. For instance, if you are looking for a reservations for two and have had no luck, try making the reservation for three guests instead. You won’t be denied seating if the number of people differs when you arrive. Keep in mind that this is something you definitely don’t want to do for restaurants that require a credit card guarantee or pre-payment. Keep trying. Walt Disney World package reservations must be paid in full 45 days in advance. Many people will cancel vacation reservations before making final payment or prior to cancellation penalty dates. With the credit card guarantee on all reservations, most people also cancel unwanted reservations by about 24-hours in advance. It never hurts to keep trying. Once arriving at Walt Disney World, try calling for Advance Dining Reservations again. At Disney resorts, guests can press DINING or *55 on in-room telephones for assistance, dial *88 on any Disney public payphone or ask the resort’s Lobby Concierge to check whether any last minute openings have become available. At the parks and resorts, same-day walk-ups are sometimes accommodated when requested in person at the restaurant’s podium. Walk-up seating may sometimes be available even when dining reservations can’t be obtained through Disney’s Advance Dining Reservation System, although you should never count on this. Wait-times for walk-ups, if accepted, can range from a few minutes to an hour or more. During extremely busy times, many restaurants will post a sign letting potential walk-up guests know that these requests are not being taken. Use your smartphone to locate availability. Guests in the parks and on Walt Disney World property can also check for table-service availability at nearby restaurants using the location-based services on your supported device. Simply search disneyworld.com/dining from your supported browser and choose to view “map view” of dining results or click on the “Near Me” link OR use the free ‘My Disney Experience’ app. Recent changes, including steps taken by Disney to reduce the number of double restaurant bookings and the introduction of a $10 credit card hold for Advance Dining Reservations at all table service restaurants and character meals, have increased the walk-up availability at many less popular restaurants. There are a few Disney restaurant reservations that can be extremely hard to get. The Chef’s table at Victoria and Albert’s usually sells out the first day it becomes available for booking and is not available on Wednesdays or Saturdays. When reserving The Chef’s Table, be sure to have the names of all party members on hand when making reservations as V&A uses them to personalized menus. You may book this reservation 180 days out by calling V&A directly at 407-939-7707, 407-WDW-DINE (939-3463) or by reserving online. By phone, a prompt will direct you to the Victoria and Albert’s line. A credit card must be used to guarantee this reservation. Other popular meals at Walt Disney World include dinner at the Be Our Guest restaurant located in Beast’s Castle at Magic Kingdom; most character meals, especially Cinderella’s Royal Table (and especially for breakfast) and Chef Mickey’s Buffet; Fantasmic! Dinner Packages; California Grill during Magic Kingdom firework hours and La Hacienda de San Angel and Rose and Crown during Epcot’s Illumination hours will also fill up quickly. Meals that absolutely require a reservation are Victoria and Albert’s and all of Disney’s Disney dinner shows: Hoop-Dee-Doo Musical Revue, and Spirit of Aloha Luau. When reserving meals specifically for firework viewing at California Grill, La Hacienda de San Angel and and Rose and Crown, plan on on scheduling meals approximately 90 minutes to 2 hours before scheduled fireworks and arriving at the podium early to let them know you are hoping for a window seat or patio seat. You will be told they can’t guarantee a specific table, but it never hurts to let them know you are looking for one. If you will be celebrating a special occasion, ask the Disney Dining reservationist to note it when making reservations and mention it again at the restaurant. Again, this guarantees nothing, but sometimes Disney does make a little magic happen. Monsieur Paul in France and Tokyo Dining in Japan can be great viewing alternatives for Illuminations if you can get a window seat, and the same goes for ‘Ohana at the Polynesian Resort and Narcoossee’s at the Grand Floridian for view Happily Ever After in the Magic Kingdom. If you simply can’t get the reservations you want and are dying to dine while watching fireworks over dessert, try making even reservations at the Plaza Restaurant in the Magic Kingdom. The restaurant offers a limited view of the Happily Ever After fireworks. For Illuminations, show up a little early at Cantina de San Angel in Mexico. No reservations are needed for this Quick Service restaurant, and patio seats offer excellent viewing of the nighttime spectacular (just be aware that the patio can get crowded during the show and kids may end up standing in front of your table to get a better view). If you can’t get reservations for California Grill during the firework viewing, don’t worry. As long as you have dined that evening, you will be allowed to return and watch the Fireworks from the restaurant’s private viewing balcony on the fifteenth-floor of the Contemporary Resort. Simply show your receipt at the 2nd floor podium to be allowed access. This is a fantastic view and shouldn’t be missed. Also, you could consider booking the Celebration at the Top Dining Experience, which will guarantee you a view of the fireworks, as well as small plates, desserts, and beverages. In addition to the special cases listed above, there are a few other restaurants that always book up quickly. The short list is below. Those using the online reservation system will have a one hour advantage over those calling when making hard-to-get reservations. Online reservations rollover to the current day beginning at 6:00 a.m. EST each day. It does appear that this may be the best way to get hard-to-come-by reservations. Make sure your resort reservation is already linked to your account before you start trying to make ADRs to save time and frustration. Dining with a large group at Walt Disney World can be challenging if it’s important that everyone sit together. A few restaurants such as ‘Ohana at the Polynesian Resort and Boma at the Animal Kingdom Lodge can easily accommodate large groups. Disney’s dinner shows, the Spirit of Aloha and Hoop De Doo Musical Revue are also great dining choices for a group. Groups of 8 people or more who want to ensure that they sit together can make ADRs by calling 407-WDW-Dine and requesting transfer to “Group Dining”. A group coordinator will help to make reservations so that your entire group can sit together. Special rules apply to Advance Group Dining Reservations and include guaranteeing reservations with a credit card. A 24-hour advance cancellation policy will also apply that charges your card a penalty of $10 per person for no-shows. All group dining reservations will have an automatic 18% gratuity applied to the restaurant bill. Even if you don’t make your Advance Dining Reservations through Disney’s Group Dining, when using the Dining Plan, an 18% gratuity is automatically added to checks for six people or more. This amount will be based on the entire cost of the meal and that gratuity will be charged directly to your room. This amount can add up on the Dining Plan and may be a cost to settle up at check-out that wasn’t planned on. Automatic gratuity for larger groups applies to the Free Dining promotion as well. If you are dining with less than six in your group, you have the option of leaving a lesser percentage if the service was not up to par. Walt Disney World restaurants, shows or dining packages that accept ADRs all require a credit card to either guarantee the reservation or full credit card payment at the time of reserving. These reservations will also have specific cancellation policies that will need to be adhered to prevent your card from being charged or to be credited a full refund. Generally, credit card guarantee policies specify canceling reservations at least 24 hours in advance or risk being charged a $10 per person penalty. For example, a reservation made for Oct. 29 must be canceled on Oct. 28 by 10 p.m. EST to avoid the fee. The few exceptions have either different cancellation periods or higher cancellation penalties and are listed below. Restaurants requiring a credit card guarantee will not charge the card except for no-shows or when cancellation penalty applies. At these restaurants, you may pay for your meal after dining by cash, room charge, credit card or Dining Plan credits. Restaurants requiring pre-payment in full will refund payment only if reservations are canceled a full day in advance. Restaurants requiring a pre-payment will refund the payment in full as long as reservations are canceled a full day in advance; otherwise, full payment is forfeited. Those on Disney’s Dining Plan should mention at the time of reserving reservations for these restaurants intentions to use table credits to pay for the meal when calling by phone. Your credit card shouldn’t be charged when reserving, but you’ll still have to give Disney the credit card number and cancellation dates and policies will apply. In order to make canceling your unnecessary reservations easier, Disney has set up a special number at 407-WDW-CNCL for easy cancellation. You can also cancel your reservations online, or at any guest relations location, restaurant podium, or resort front desk. To avoid any applicable penalty, the cancellation must be made up to 11:59 p.m. on the day before the reservation is scheduled. Most Walt Disney World Resort table service restaurants can accommodate food allergies and food intolerances, such as gluten or wheat, shellfish, soy, lactose or milk, peanuts, tree nuts, fish or eggs, with advance notice. When making Advance Dining Reservations online or by calling Disney’s Dining line, indicate any allergies you may have at the time of making the reservation. Call a representative at 407-824-5967 once you have booked your dining reservations, at least 14 days in advance. Additionally, chefs at Disney table service restaurants are always happy to take time to talk to guests about their dietary needs or answer questions about menu selections. At Quick Service restaurants, ask for Oodies brand hamburger or hotdog buns – they are dairy-free and gluten-free and many counter service restaurants carry them. All Quick Service counters have ingredient lists available, but these are limited to the items made on site. Quick Service counters should also be able to suggest safe substitutes when available. Tofutti brand soy products are available everywhere Disney sells hand-dipped ice cream. Soy milk is available in the grab ‘n go sections of most Walt Disney World resorts. Walt Disney World Resort does not have separate kitchens to prepare allergen free items or separate dining areas for Guests with allergies to dine. Some restaurants may have dedicated fryers for those with gluten allergies, however. You’ll need to inquire when ordering. Kosher meals must be requested at least 24 hours in advance by calling (407) 939-3463. A 48-hour notice is needed for table service restaurants at the Swan and Dolphing resorts, Yak & Yeti Restaurant in Animal Kingdom, and both Rainforest Cafe locations. Kosher meals are not offered at Garden View Afternoon Tea, Teppan Edo and Tokyo Dining. A credit card is required to guarantee Kosher orders; however, your card will not be charged unless the reservation is canceled in less than 24 hours or the party is a no-show. Disney’s “Mickey Check” gives health-conscious parents a recognizable shortcut to identifying Kids’ Meals that meet the Disney Nutrition Guidelines on counter service menus throughout Walt Disney World Resort. Following the U.S. Dietary Guidelines for Americans, the Disney Nutrition Guidelines also encourage the limitation of sodium, sugar, and saturated and trans fats. To meet these guidelines, meals carrying The Mickey Check must contain at least three of the following: 1) fruits and vegetables, 2) low-fat dairy, 3) whole grains and 4) lean protein, beans, eggs, and/or nuts. Kids’ meals must be ordered as they appear on the menu, without substitutions, to meet the Mickey Check guidelines. For more information on special dietary needs, or a list of Quick Service locations that carry special dietary or Kosher meals (with no advance notice needed), visit Disney’s web site or email SpecialDiets@DisneyWorld.com. Write down or print Advance Dining Reservations numbers when reserving restaurant meals and take them with you to the restaurant. This is your proof of a dining reservation. It’s also good to reconfirm your reservations before leaving home. If you are staying on Walt Disney World property, you can request a list of all of your ADRs at anytime from the Lobby Concierge of your resort. Be aware of Seasonal Pricing changes during holidays and other peak-times. TheMouseForLess keeps a list of dates and restaurants that charge them here. If your Disney’s Advance Dining Reservations are prior to park opening, Disney runs special buses for early breakfast in the parks. Be sure to bring your confirmation number as the cast member at the park turnstile may ask for it before admitting you to the park. You will still need to have a park admission ticket to enter the park early for breakfast. All Walt Disney World Resort restaurants are non-smoking. Most Walt Disney World restaurants have a “resort casual” dress code, meaning shorts are okay, but shoes and shirts should be worn and no bathing suits. Tank tops for men are also discouraged. A few restaurants require dressier clothing and information will be provided when making your reservations. As of this writing “business casual” dress requiring dress slacks or shorts & shirts with a collar for men and dress slacks or shorts or a dress for women is required the following “Signature” restaurants: Jiko – The Cooking Place (Animal Kingdom Lodge), Flying Fish Cafe (BoardWalk), California Grill (Contemporary Resort), Citricos and Narcoossee’s (Grand Floridian Resort), Artist Point (Wilderness Lodge), and Yachtsman Steakhouse (Yacht Club Resort). Also included at the Swan and Dolphin Resort are Il Molino New York Trattoria, Shula’s Steakhouse, and Todd English’s bluezoo. Victoria & Albert’s at the Grand Floridian resort requires a suit and tie for men and evening wear for women. Walt Disney World guests can now request their favorite WDW restaurant recipes via a special form distributed at the restaurants. Requested recipes can be either emailed or sent to your mailing address. The form states that recipes have been converted from large batches to smaller serving amounts and thus may taste slightly different than those experienced in the restaurants. If you’ll be driving your vehicle to one of the Epcot or Magic Kingdom resorts and plan to dine, be sure to have your confirmation number handy. Guards strict about admitting anyone to the parking lots of these resorts that are not authorized to be there! As a special service, The Magic for Less Travel will make Advance Dining Reservations directly though Disney for clients. There is no charge for their services. You may contact them filling out a quote form to receive a no-obligation quote or to learn more about the special incentives and services they offer. Visit our Money-Saving Dining Tips page to get lots of advice on dining at Disney as well as money saving tips and coupons.